Wolves boss Kenny Jackett says his side lacked creative energy in their 1-0 midweek defeat by lowly Bristol City. Jackett even substituted top scorer Benik Afobe at half-time, in the hope that a new-look, more experienced strike pairing of Adam Le Fondre and Grant Holt might pay dividends. 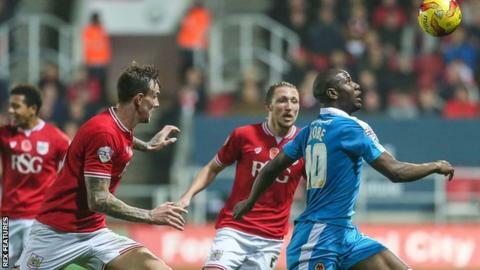 "It looked in the first half like we needed some support in terms of a second forward," Jackett told BBC WM. "But we didn't trouble their goalkeeper in either half. We never got going." Wolves' fourth defeat in five games against a City side beaten 4-1 at home by Fulham on Saturday was all the more surprising coming on the back of Wolves' own impressive 2-0 away win in the derby game against Birmingham City at the weekend. "After a good win at Birmingham, we didn't have our usual energy. We had a good following, but it was a flat performance for our away support. "It is concerning. We didn't look creative enough. I wanted to give Le Fondre and Holt a go as a pair to see if they could affect things going forward. We huffed and puffed but, against a well-organised Bristol City side, we could not break them down." With Nouha Dicko out for the season and Afobe reportedly linked with a host of clubs since he first arrived at Molineux in January, it was an opportunity for Jackett to see what his frontline might look like if up-for-sale Wolves did accept a bid for their seven-goal top scorer. But Jackett's immediate short-term concern is to get the former Arsenal youngster firing on all cylinders again, starting on Saturday with the visit of second-placed Burnley. "He'll have to bounce back from it and look to give defenders trouble again," said Jackett. "And I'm sure he's capable of that. We have an opportunity at home to Burnley to go and put it right."